great movie! And great actorship! Loved this movie so much. Rarely can I sit through an entire movie let alone watch it TWICE. That good!!! I agree with the previous reviews. This was one of the best movies I've seen all year. Suspenseful story telling, great acting and with no CGI. Maybe movie sleeper of 2017. Great movie, full of suspense. You will appreciate it if you are intelligent and mindful of American issues. Great story; dark, moody and well acted. Only one cheesy line in the movie, “why don’t you come hunt one for me “ referring to a human predator. A cold, lonely and desolate existence has a tendency to make for a perfect environment for bad things to happen, and they do. My wife and I made it about half way through it before I took out a pocket knife and we discussed slitting our wrists. we walked out. OMG, so boring, class C acting and laughable to think someone paid big money to have this movie made. Total waste of money if you go to the movies to see something interesting. Definitely not ready for prime time. One of the best sleepers of the year. Well acted. Interesting plot. Action explodes upon you. Totally unexpectedly engrossing. Loved it. Jeremy Renner is quite masterful - he's so, soooo underrated! Native American Performers were terrific. Liz Olsen, not so much. Riveting action... Grieving scenes much needed in our realm, as is education on the shocking prevalence of violence against women, no less Native American women!. A great movie that keeps your attention though out the whole movie and looking for the ending which is unveiled only at the end. An excellent movie, a lot to learn. I would recommend it. The content is sad but, it provides knowledge. excellent on the edge of your seat movie. Great acting. Try to see it without knowing too much about the plot. You won't be disappointed. This was fairly well written and well acted. Good filming and sensitive to some issues re: Native American and American interaction especially with regards to resource extraction on or close to Native lands. Some may think its not realistic with how the goons and out-camp workers were portrayed. But I know better...it can be exactly like that! Although I don't think a incident between goons and enforcement like the one portrayed in the movie could ever happen in North America, it probably has happened in other countries...and who knows in the future as resource scarcity becomes an emerging issue. I would watch it again and recommend to a friend. I think any CO's in Canada who go see this could learn a lesson. I just saw this movie and was pleasantly surprised. I think this is one of the best movies of the year. The plot was outstanding! The performances were so well done by all involved, I could see a great many nominations and awards coming out of this one movie. Go see it! Very good movie! Worth seeing for sure. Realistic as hell .Worth the money and time to see it. Great movie with a special message! I am a Tony Hillerman fan. This movie had that flavor. Whined River is just that. If you haven't gone to see it yet, then you have something to give thanks for during the holidays. Great movie. The fellow who came with me said he didn't expect it to be as good as it turned out to be. Really worth going to see, but the content is a sad reality. We have to do better. Worth all 5 stars. The movie is meaningful and impactful. The message is short and clear and actually brings awareness to issues we as a society often neglect. very well done. Definitely the best movie of 2017. A very real and relevant story, highlighting a sad truth about our society. Very well done. The BEST movie of the year. It held my attention every minute right to the end. Great acting. Would love to see Jeremy Renner in more good movies. He was very good. No words can describe how powerful and raw this movie is. It is brilliant all around. Although audeince members should be warned, this is not a movie for the faint of heart, though that is part of its beauty. Highly recommended. The acting was great. Well done in my opinion. Good movie, one of the best movies this year. An opinion from someone who sees a movie every week. Jeremy Renner was outstanding in this movie. I'm glad someone has brought this subject out in the open. Thank you. Very thought provoking movie . Outstanding acting , story line and scenery. Movie is original, surprisingly action packed and emotional. No cgi -realistic. Excellent movie. 5 Stars Best Movie I've seen in a long time!!! Great acting. Jeremy Reimer deserves an Oscar nod for this one! Great story. Was on the edge of my seat the whole time!!! Also showcases the struggles Native Americans face especially missing Indigenous women! Got me right in the heart! I would see it again !!!! A must See!!!! Great movie. Keeps you on the edge of your seat. Whats all the complaints about the sound. Im 63, saw it a rinky dink theater in small town BC and had no problem. Put your popcorn down get up and tell the manager to turn it up. Still an award winning movie best and one of the best shoot out scenes. Only complaint it was set in an enviroNment that was supposed to be killing cold but looked like a nice spring day in most shots. Ie. Could see no ones breath. I really enjoyed this movie. This is probably one of the best face to face shootouts since Ok Corral. Acting by Olsen and Reiner was excellent. For sure it will get a nod for Best Picture. Portrayal of how indigenous peoples are treated especially its women is sad but true. 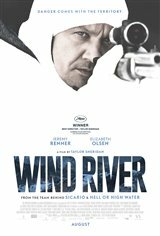 Only unbelievable point in this movie was that it really looke like a warm soring in the mountains not the -50 it was portraying. The Website is owned and operated by Tribute. Any and all content, data, graphics, photographs, images, audio, video, software, trademarks, service marks, trade names and other information (collectively, the "Content") contained in this Website are proprietary to Tribute, its affiliates and/or third-party licensors. The Content is protected by Canadian and international intellectual property laws. Except as set forth herein, you may not use, modify, copy, reproduce, publish, post, transmit, distribute, display, perform, create derivative works from, transfer or sell any Content without the express prior written consent of Tribute. Unless otherwise specified, the Website is for your personal and non-commercial use and for purely informational purposes. Although Tribute takes all possible steps to ensure the accuracy of the information or Content included on this Website, no assurance is given that information or material on this Website is up-to-date, accurate, error-free or complete. Tribute takes no responsibility for errors or omissions in the information or Content of this Website. We reserve the right to correct, change or update information at any time without prior notice. To access certain portions of the Website, you may be asked to complete an online registration form. In consideration for your use of this Website and the Services provided on it, you agree to provide true, current, complete and accurate information as requested on any registration form to which this Website may direct you, and to update that registration information as soon as possible after any information on such registration form changes. As part of the registration process, you may be asked to provide a user name or password. You alone are responsible for keeping that password and user name confidential, and for any and all activity that occurs on this Website under such password or user name. You agree to immediately notify Tribute of any unauthorized use of your password or user name or any other breach of security. From time to time we may offer and/or co-sponsor contests or other promotions on the Website. Each of these activities shall be governed by specific rules accessible from the pages of the Website offering the contest or promotion or when you submit your entry. We may offer links on the Website to websites, including social networking websites, which are owned and operated by third parties. We provide these links as a convenience to our visitors. We do not review the content of such websites, and neither endorse, nor are responsible for, any content, advertising, products, services or other materials on or available from such third party websites. You assume full responsibility for your use of third party websites. Such websites are governed by terms and conditions different from those applicable to this Website, and we encourage you to review the terms and privacy policies of those third parties before using their websites. use, download or otherwise copy, or provide to any person or entity any Website users directory or other user or usage information or any portion thereof other than in the context of your use of the Website. The foregoing is hereinafter collectively referred to as the "Code of Conduct". THE LAWS OF CERTAIN JURISDICTIONS, INCLUDING QUEBEC, DO NOT ALLOW THE EXCLUSION OR LIMITATION OF LEGAL WARRANTIES, LIABILITY OR CERTAIN DAMAGES OR LIMITATION OF REPRESENTATIONS MADE CONCERNING GOODS OR SERVICES. IF THESE LAWS APPLY TO YOU, SOME OR ALL OF THE BELOW EXCLUSIONS OR LIMITATIONS MAY NOT APPLY TO YOU. Although we strive to update and keep the Content contained on the Website accurate as much as possible, errors and/or omissions may occur. ACCORDINGLY, THIS WEBSITE, INCLUDING THE CONTENT AND SERVICES PROVIDED HEREIN, IS BEING PROVIDED ON AN "AS IS" BASIS AND WITHOUT WARRANTIES OF ANY KIND, EITHER EXPRESS OR IMPLIED. TRIBUTE DISCLAIMS ALL WARRANTIES, EXPRESS OR IMPLIED, INCLUDING, BUT NOT LIMITED TO, IMPLIED WARRANTIES AND CONDITIONS OF MERCHANTABILITY, FITNESS FOR A PARTICULAR PURPOSE, AND NON-INFRINGEMENT. TRIBUTE DOES NOT WARRANT THAT THE FUNCTIONS ON THE SITE WILL BE UNINTERRUPTED, ERROR-FREE OR FREE OF VIRUSES OR OTHER HARMFUL COMPONENTS. IN NO EVENT SHALL TRIBUTE BE LIABLE FOR ANY DIRECT, INDIRECT, INCIDENTAL, SPECIAL, OR CONSEQUENTIAL DAMAGES THAT RESULT FROM OR IN CONNECTION WITH THE USE OF, OR THE INABILITY TO USE, THE WEBSITE OR ANY CONTENT OR SERVICES, EVEN IF TRIBUTE HAS BEEN ADVISED OF THE POSSIBILITY OF SUCH DAMAGES. All marks, graphics, typefaces, trade dress, trademarks and logos appearing on the Website are property of Tribute or of their respective owners. Our trademarks, trade dress and other intellectual property may not be used in any manner for any purpose without our express written consent.